I had began to think I would never see Newcastle take the lead three times at Old Trafford in my lifetime, never mind in ninety minutes. Fergie might have messed around a bit with his line-up but Newcastle United had the clothes they stood up in. 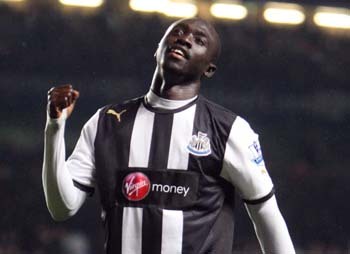 From Demba Ba’s early hopeful shot when James Perch put in the rebound, Newcastle United were always in the match. As you watched it unfold in front of you, you just knew it was up for grabs today. By the end of the ninety minutes you would have to be a fool, or a Man.U. fan sitting in Torquay, to claim that Newcastle hadn’t deserved anything from today. Any result in football is possible but for NUFC to have more shots on target (11 to 10) suggests an overall performance that contradicts just about every visit we have made in the last forty years. Dishing out blame/credit is always tricky but while the home side might not have been at their best, Newcastle were definitely the better side. When Demba Ba sent in a hopeful long range shot after four minutes and Perch snapped up the rebound, you expected the Mancs to lay siege but it never came. While the home side did equalise twenty minutes later it was just another example of weak defending, a bog standard free-kick from deep, ended in a scramble that Evans finished. However, only a few minutes later we saw United go back in the lead as Simpson did really well to drive in towards the box and hit a low cross that Evans comically turned in, after much discussion the goal was given, as offside concerns were obliterated by the fact it was a simple own goal. The frightening thing today was how comfortable Newcastle looked and if Marveaux had curled his free-kick under the bar instead of against it then I think it could have been game over. Instead, Man.U. came out second half all fired up but despite this, were going nowhere. That is until Evra popped up on the edge of the box to hit a shot through a crowd of players and under Krul’s hand with almost an hour on the clock. In an end to end match, it was Obertan who took advantage of a quick throw to get down the left and give Cisse the ammunition to provide a classic left foot finish. The game had totally opened up and when Colo took a swipe in the face from Van Persie in the middle of the pitch, it created space and opportunity, Van Persie finished second time in the box with Coloccini still on his way back. Sammy Ameobi struck the post with De Gea again well beaten but with the match now so open you knew it favoured the home side. Maybe Newcastle’s biggest weakness was protection in front of the back four and Carrick’s clipped ball saw Newcastle outnumbered just inside the box, Hernandez hitting the winner. The fact Alan Pardew had taken off both Ba and Cisse was hard to fathom as it left us with no natural goalscorer. The final sickener was a cowardly Valencia challenge that saw Anita stretchered off, Mike Dean bottling the decision to send him off with a second yellow. However, the biggest disgrace was Ferguson and Phelan abusing the linesman for long periods without the referee and fourth official coming to his assistance. Ferguson pretends to be a leader in the game but he is a fraud, somebody who would struggle to spell Respect.